The VanderZanden name carries both the wounds and potential bounty of years of land-use battles. Some members of the deeply rooted Washington County farm family will turn a substantial profit when they, inevitably, sell their tulip farm and hundreds of rural acres running along Northwest Jackson School Road near Hillsboro. It’s the same stretch that Bob VanderZanden has long fought to protect, filing appeals and protesting decisions on county growth that he contends minimize the role of agriculture. Time and growth, however, have rendered development an inevitability, and VanderZanden something of a reluctant pragmatist. The land sits a stone’s throw from Hillsboro, where the population is projected to grow more than 60 percent by 2040 and reach 150,000 people. VanderZanden would prefer to farm the land as long as his health will allow; most of his siblings, with whom he co-owns the land, want to sell, he concedes. It’s the land his parents bought outright in 1958 after moving there in 1934. The 160-plus acres is a mix of clover and other crops, perhaps most easily recognized in the spring for its rows of vibrant tulips. Cue the land-use grand bargain, the swift-moving and unprecedented legislative process that undid, then redid, the urban and rural reserves in February. The VanderZandens’ land moved from urban reserves, or land set aside for future development, into the urban growth boundary, land available for development whenever a deal is struck. It would seem a small distinction; either way, the land is designated for development. In reality, though, it means significant value added to the property. That’s good news for the VanderZanden clan as a whole. 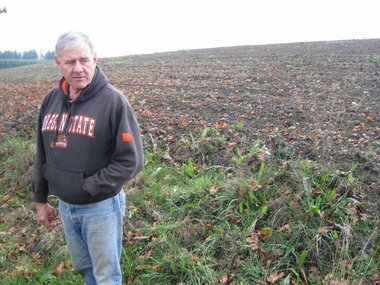 But for Bob VanderZanden, it means his land will sell sooner rather than later. The urban reserves designation had afforded him a measure of comfort. It gave him time. The most recent land-use battle dates back to 2010, when VanderZanden was among a handful of local landowners and conservation groups to appeal the reserves process. It was a move that VanderZanden and others say came with political consequences in a county that was built on agriculture but is now home to the tech-heavy Silicon Forest. (It’s almost a cliche when VanderZanden points to the outline of rising industry at the periphery of his land). VanderZanden began loudly protesting the reserves decision in 2010, and he soon found himself ousted from the Washington County Farm Bureau board along with Dave Vanasche and Larry Duyck. That hurt, he said, but it was just politics. The group won the reserves appeal after a lengthy wait in February, but a deal, the so-called “grand bargain” struck over the course of a weekend rendered that ruling moot. Land was swapped, locked and legislated into developable or undevelopable behind closed doors in late February. Though VanderZanden and others who’d appealed the original decision were in the room for some of those meetings, they didn’t have much of a voice, he said. Now, five, maybe 10 years from now, the yellow, pink and purple incandescent tulips that dot the landscape along Jackson School Road in the spring will likely become housing or a mixed-use development. It’s prime territory, in close proximity to Hillsboro Airport, Intel’s multibillion-dollar D1X operations and the gateway to Hillsboro. But it will mark both a substantial and symbolic shift. Agriculture is a nearly $2 billion a year industry in Washington County, according to 2012 state data, and responsible for $1.3 billion in land and attached assets. But the emphasis has shifted: There are more nursery and small organic farms, and the dairy farms that were once prevalent have all but disappeared (the VanderZanden’s tulip patch was once home to grazing cows). As of the 2007 agricultural census, conducted every five years, the county had lost nearly 61,000 acres of farmland to development over 33 years. Under the grand bargain, 1,190 acres were put into the Urban Growth Boundary. Even without the February decision, VanderZanden said, farms that border the county’s burgeoning growth are finding it increasingly difficult to coexist. Slow-moving farm equipment and the long line of cars rushing off U.S. 26 and into Hillsboro are a disaster waiting to happen, he said. For now, VanderZanden will relish the dwindling days of tulip season.